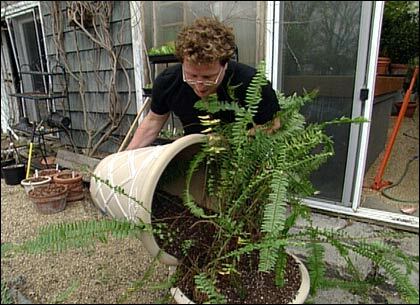 Michael desperately needed to tame this overgrown fern. What do you do when a plant gets out of control? Well, some people may not know that dividing plants is a safe garden basic that lets you bring your overgrown plants to heel and multiply your supply of separate plants in the process. 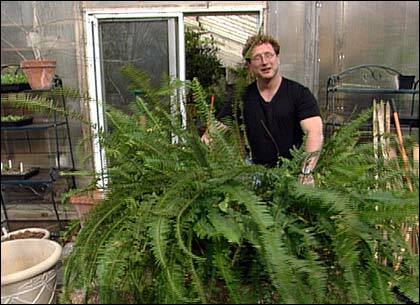 On the show, host Michael Weishan used one of his own monster ferns to demonstrate how just about any plant that grows from a clump with numerous stems can easily be halved or even split into thirds. Use a spade to cut the root ball into halves or thirds. 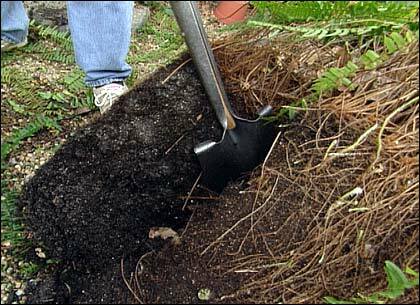 To begin you just take the plant out of its pot and, depending on the size you're dealing with, use a spade or other sharp tool to cut clear through the root ball. As Michael says, this is not a subtle process, so don't be afraid to hack away. Once you've got separate sections, all you do is replant them in different pots. We recommend using a light soil-less mix. Pre-fill the pot with a bottom layer of mix, such that the clump will rest at about the same height in the pot as the original plant. Place your clump in the pot and fill around it the rest of the way with more mix, pressing down firmly around it to help remove air pockets. Any excess dirt will wash away when you water. Your replanted section will need a good heavy watering, which will also further help to rid your soil of air pockets. The divided sections can be replanted and, once they recover, will begin to grow anew. Bear in mind that your new but recently very roughly treated plant will take some time to recover from the trauma you've inflicted on it, so don't expect it to look like much for a little while. But within a month or two the plant will begin to send new shoots up through the soil, and by the end of the season you'll have back the vigor and beauty of your original plant, under control, and times two or three!